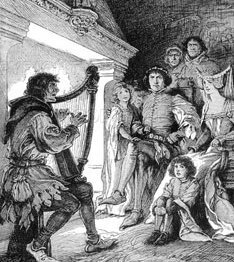 An emotionally stirring and inspirational song, the "Minstrel Boy" was written by Thomas Moore (1779-1852) who set it to the melody of "The Moreen", an old Irish aire. It is believed by many that Moore composed the song as a memorial to several of his friends he had met while a student at Trinity College and who had participated in the 1798 rebellion of the United Irishmen. One died in prison, another was wounded, and a third captured and hung. The song originally consisted of two verses. Due to its popularity, a third verse was added by unknown authors at the time of the US Civil War. The lyrics below are divided into six verses as an aid to readability. One faithful harp shall praise thee !" Thou soul of love and brav'ry ! They shall never sound in slavery !" "The remarkable thing is that such Moore Melodies were rousingly sung around the piano in Victorian English drawing rooms oblivious of the fact that 'the foeman' and 'slavery's chains' referred to the English yoke." Due to its popularity, the following third verse in English was added by an unknown author. When we hear the news, we all will cheer it. The immediate origins of the 1798 Rebellion in Ireland can be traced to the setting up of the Society of United Irishmen in Belfast in October 1791. Inspired by the French Revolution, and with great admiration for the new democracy of the United States, the United Irishmen were led by Theobald Wolfe Tone, Thomas Russell, Henry Joy McCracken and William Drennan. They came together to secure a reform of the Irish parliament; and they sought to achieve this goal by uniting Protestant, Catholic and Dissenter in Ireland into a single movement.